Is it better to cut blooms off succulents or let them flower? Hi Enid — It’s really a matter of personal preference. Generally I let them bloom, but occasionally I snip off flowers that I don’t like the looks of (such as the dandelion tufts of senecios) or that tend to drain too much energy from the plant, such as those of flapjack plants (Kalanchoe luciae). Agaves die after flowering, but you can’t stop that from happening by removing their bloom spikes, so you might as well enjoy the show. What is the plant right lower corner top pic. I won it in a silent auction and would like to know what it is. Ty. Such a beautiful arrangement – I love it! I am surprised to see the inclusion of the lithops. I love the look, but I would have thought it might be challenging to water the entire arrangement without over watering them? I am still v-e-r-y new to lithops, but eager to work with them. Are they not as difficult to care for if planter among other succulents as I thought? Excellent observation, Kathleen. I agree, and would not have included them. Too fiddly. A similar living stones type of succulent commonly called baby toes (fenestraria) would have been a better choice. Good catch! Yes! Baby toes – I hadn’t thought of them, but that would be perfect in an arrangement like this. How does the drainage work with this arrangement? No drainage. Water it minimally. 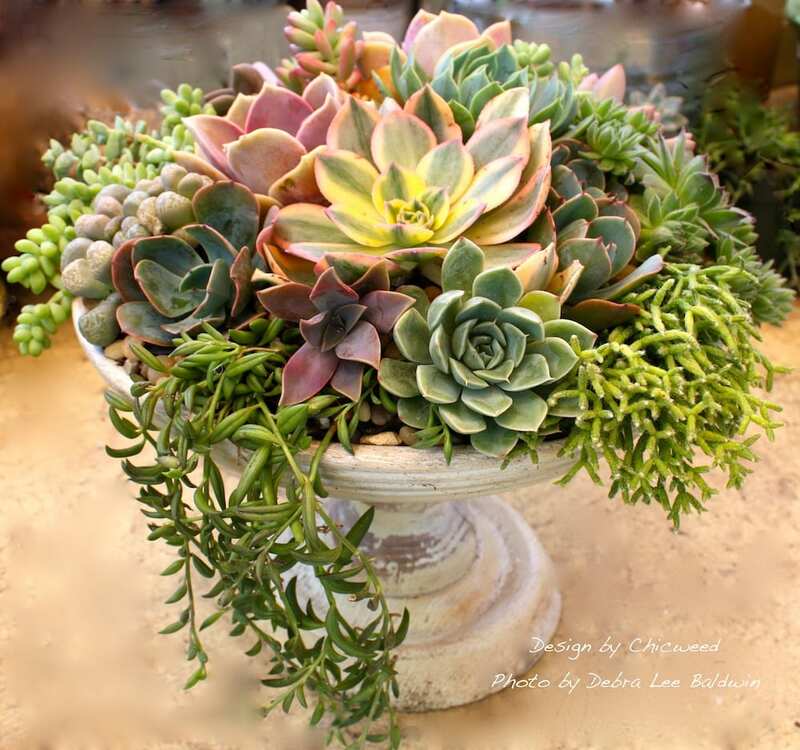 More info on succulents in nondraining containers is in my books and Craftsy class. Love your style! I have been looking for something just like this. I am having trouble finding the urn or pot to go under it though. It seems I see one every time I go thrifting. If that doesn’t do it, search Ebay for cake plates.